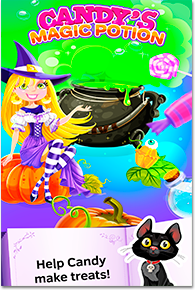 This night Candy witch decided to put aside her witchy business for a while and cook something special for the upcoming Halloween party – the main holiday of witches and wizards, enchanters, sorcerers and all fantastic creatures of all kind. But it turned out that Candy didn’t have necessary ingredients! So, she searched through her spell books and found a very powerful charm which turns creepy magic objects into delicious sweets! Help this little witch make Halloween candies or she’ll be late for the party of the year! Here’s what you need to do in this alchemy game, apprentice. Brew magic potions, mix various ingredients and cast spells to create yummy treats for this exciting Halloween adventure! Pumpkins, spiders, and bats have never been so sweet! Check every possible combination. Get all candies in this alchemy puzzle game! Mmmm… Yummy! * One can’t lose in this easy toddler Halloween cooking game so your little one won’t get upset that something’s going wrong. They’ll want to replay the game again and again! Candy’s Magic Potion is a game in educational series that is good for both phones and tablets so that your little ones could practice their skills everywhere and whenever they want! Grab potions and let’s play magic spell casting games! It’s trick or treat time - the most bewitching time of the year!